This paper proposes an approach to fuzzy modeling of a nonlinear servo system application represented by an electromagnetic actuated clutch system. The nonlinear model of the process is simplified and linearized around several operating points of the input-output static map of the process. Discrete-time Takagi-Sugeno (T-S) fuzzy models of the processes are derived on the basis of the modal equivalence principle; the rule consequents of these T-S fuzzy models contain the state-space models of the process. Three discrete-time T-S fuzzy models are suggested and compared. The simulation results validate the new fuzzy models of the electromagnetic actuated clutch system. Škrjanc, I.; Blažič, S.; Agamennoni O. (2005); Identification of dynamical systems with a robust interval fuzzy model, Automatica, 41(2):327-332. Identification of dynamical systems with a robust interval fuzzy model, Automatica, 41(2):327-332. Johanyák, Z.C. (2010); Survey on five fuzzy inference-based student evaluation methods, in: Computational Intelligence in Engineering, I. J. Rudas, J. Fodor, J. Kacprzyk, Eds., Studies in Computational Intelligence, Springer-Verlag, Berlin, Heidelberg, 313:219-228. Vaščˇak, J.; Madarász, L. (2010); Adaptation of fuzzy cognitive maps-a comparison study, Acta Polytechnica Hungarica, 7(3):109-122. Babu Devasenapati, S.; Ramachandran, K. I. (2011) Hybrid fuzzy model based expert system for misfire detection in automobile engines, Int. J. of Artificial Intelligence, 7(A11):47-62. Dzitac, I; Vesselényi, T; Tarcă, R. C. (2011) Identification of ERD using fuzzy inference systems for brain-computer interface, INT J COMPUT COMMUN, ISSN 1841-9836, 6(3):403- 417. Taniguchi, T; Tanaka, K.; Yamafuji, K.; Wang, O.H. (1999) A new PDC for fuzzy reference models, Proc. of 1999 IEEE Int. Conf. on Fuzzy Systems, Seoul, Korea, 2:898-903. Eksin, I.; Erol, O.K. (2000) A fuzzy identification method for nonlinear systems, Turkish Journal of Electrical Engineering and Computer Sciences, 8(2):125-135. Hwang, V.-L.; Jan (2002) A DSP-based fuzzy robust tracking control for piezoelectric servosystems, Proc. of 2002 IEEE International Conference on Fuzzy Systems, Honolulu, HI, USA, 2:1410-1415. Mihai, D. (2004) Discrete fuzzy control loops based on a motor neuro-fuzzy model. Pushing too far a continuous logic?, Proceedings of 2004 IEEE International Conference on Fuzzy Systems, Budapest, Hungary, 2:587-592. Chien, T.-L.; Chen, C.-C.; Tsai, M.-C.; Chen, Y.-C. (2010) Control of AMIRA's ball and beam system via improved fuzzy feedback linearization approach, Applied Mathematical Modelling, 34(12):3791-3804. Cerman, O.; Hušek, P. (2012) Adaptive fuzzy sliding mode control for electro-hydraulic servo mechanism, Expert Systems with Applications, 39(11):10269-10277. Precup, R.-E.; Preitl, S. (1999) Fuzzy Controllers, Editura Orizonturi Universitare Publishers, Timişoara. Orlowska-Kowalska, T.; Szabat, K.; Jaszczak, K. (2002) The influence of parameters and structure of PI-type fuzzy-logic controller on DC drive system dynamics, Fuzzy Sets and Systems, 131(2):251-264. Precup, R.-E.; Preitl, S.; Faur, G. (2003) PI predictive fuzzy controllers for electrical drive speed control: Methods and software for stable development, Computers in Industry, 52(3):253-270. Precup, R.-E.; Preitl, S.; Korondi, P. (2007) Fuzzy controllers with maximum sensitivity for servosystems, IEEE Transactions on Industrial Electronics, 54(3):1298-1310. Angelov, P.; Lughofer, E.; Zhou X. (2008) Evolving fuzzy classifiers using different model architectures, Fuzzy Sets and Systems, 159(23):3160-3182. Precup, R.-E.; Preitl, S.; Petriu, E.M.; Tar, J.K.; Tomescu, M.L. 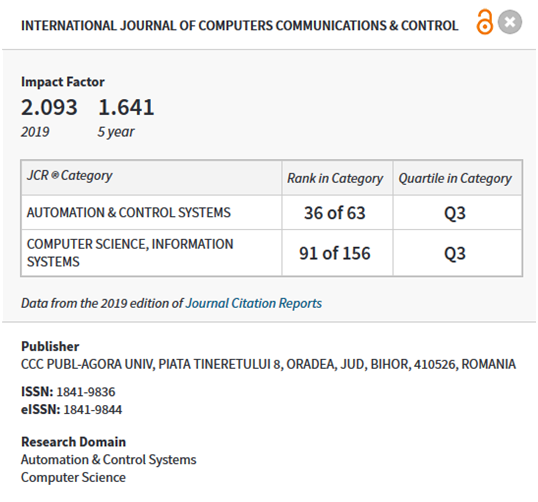 ; Pozna, C. (2009) Generic two-degree-of-freedom linear and fuzzy controllers for integral processes, Journal of The Franklin Institute, 346(10):980-1003. Linda, O.; Manic, M. (2011) Interval yype-2 fuzzy voter design for fault tolerant systems, Information Sciences, 181(14):2933-2950. Khanesar, M. A.; Teshnehlab, M.; Kaynak, O. (2012) Control and synchronization of chaotic systems using a novel indirect model reference fuzzy controller, Soft Computing, 16(7):1253- 1265. Di Cairano, S.; Bemporad, A.; Kolmanovsky, I.V. ; Hrovat, D. (2007) Model predictive control of magnetically actuated mass spring dampers for automotive applications, International Journal of Control, 80(11):1701-1716. Dragoş, C.-A. ; Preitl, S.; Precup, R.-E.; Petriu, E.M.; Stînean, A.-I. (2011) A comparative case study of position control solutions for a mechatronics application, Proc. of 2011 IEEE/ASME International Conference on Advanced Intelligent Mechatronics, Budapest, Hungary:814-819. Angelov, P.; Buswell, R. (2003) Automatic generation of fuzzy rule-based models from data by genetic algorithms, Information Sciences, 150(1-2):17-31. Precup, R.-E.; Tomescu, M.-L.; Preitl, S. (2007) Lorenz system stabilization using fuzzy controllers, INT J COMPUT COMMUN, ISSN 1841-9836, 2(3):279-287. Johanyák, Z.C. (2010) Student evaluation based on fuzzy rule interpolation, Int. J. of Artificial Intelligence, A10(5):37-55. Vaščák, J.; Madarász, L. (2010) Adaptation of fuzzy cognitive maps-A comparison study, Acta Polytechnica Hungarica, 7(3):109-122. Sadighi, A.; Kim, W.-J. (2011) Adaptive-neuro-fuzzy-based sensorless control of a smartmaterial actuator, IEEE/ASME Transactions on Mechatronics, 16(2):371-379. Ho, T.H. ; Ahn, K.K. (2012) Speed control of a hydraulic pressure coupling drive using an adaptive fuzzy sliding-mode control, IEEE/ASME Transactions on Mechatronics, 17(5):976- 986. Precup, R.-E.; Preitl, S. (2004) Optimisation criteria in development of fuzzy controllers with dynamics, Engineering Applications of Artificial Intelligence, 17(6):661-674. Blažič, S.; Matko, D.; Škrjanc, I. (2010) Adaptive law with a new leakage term, IET Control Theory & Applications, 4(9):1533-1542. Sánchez Boza, A.; Haber-Guerra, R.; Gajate, A. (2011) Artificial cognitive control system based on the shared circuits model of sociocognitive capacities. A first approach, Engineering Applications of Artificial Intelligence, 24(2):209-219. Liu, T.; Hu, Z. (2011) Immune algorithm with memory coevolution, Int. J. of Artificial Intelligence, 7(A11):189-197. Niu, B.; Fan, Y.; Wang, H.; Li, L.; Wang, X. (2011) Novel bacterial foraging optimization with time-varying chemotaxis step, International Journal of Artificial Intelligence, 7(A11):257-273. Damanafshan, M.; Khosrowshahi-Asl, E.; Abbaspour, M. (2012) GASANT: An ant-inspired least-cost QoS multicast routing approach based on genetic and simulated annealing algorithms, INT J COMPUT COMMUN, ISSN 1841-9836, 7(3):417-431. Rankovic, V.; Radulovic, J.; Grujovic, N.; Divac, D. (2012) Neural network model predictive control of nonlinear systems using genetic algorithms, INT J COMPUT COMMUN, ISSN 1841-9836, 7(3):540-549. Bacanin, N.; Tuba, M. (2012) Artificial Bee Colony (ABC) algorithm for constrained optimization improved with genetic operators, Studies in Informatics and Control, 21(2):137-146. Ben Omrane, I.; Chatti, A.; Borne, P. (2012) Evolutionary method for designing and learning control structure of a wheelchair, Studies in Informatics and Control, 21(2):155-164.